and practical explanation and preparing students for the board sems. and practical explanation preparing students for the board sems. From their Excellent training strategy. sophisticated methodology to gain super knowledge in super easy way, get experience of the trainer he earned giving to industry in hours using direct to the point teaching. 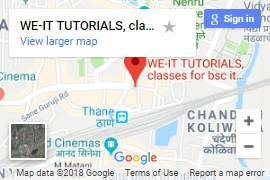 We-IT tutorial is better place to get start your journey in IT industries and excellent for learning advance technology. no 1 experience for programming and practical knowledge. Great Practical Knowledge and Academics with Focus on Current Advanced technologies .